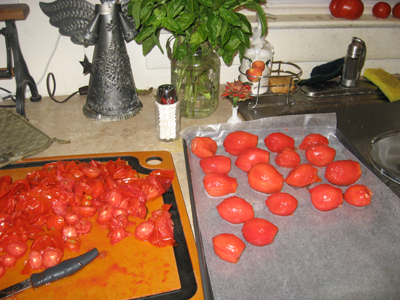 I had a basket heaped with ripe paste tomatoes, and no time. I’ve been putting in 10-hour days at work, and coming home to two teenagers leaving for college. The laundry, the locating, the shopping, and prep have just about done me in. I collapse into bed exhausted and wake up 4 hours later, completely stressed, making lengthy lists in my head. I cannot rest until I get up, drink coffee and write my lists down. Tomorrow night is the last night before we head off to my son’s college. I am sure the evening will be filled with flurry. That left tonight for the tomatoes. 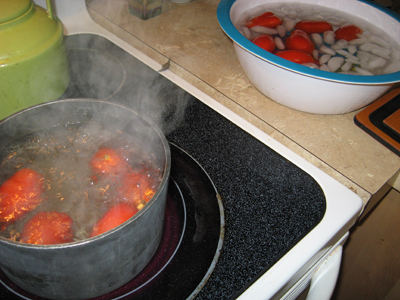 It's almost getting to be a routine: drop the tomatoes into boiling water for a few moments, and then lift them with a slotted spoon into an ice bath. I cut off the stem end, slipped the peel off, and removed all bruises. I placed the tomatoes on a cookie sheet lined with waxed paper. The tomatoes were not allowed to touch each other. I want my croquet balls, after all. And into the freezer they go! Can you see my tubs of home-made tomato sauce on the shelf below?! I did test the cookie sheets before trying to insert them, loaded with wobbly rolling tomatoes, onto a shelf laden with uneven items. I rested each cookie sheet inside the freezer, and after 4th and final sheet was safely placed, I closed the door. That was 1 hour ago. I wonder how long it will take before they freeze hard enough to remove, and bag? As one cookie sheet is resting on top of the box that contains my husband’s palette of oil paints, I hope it’s soon! I am very happy to have harvested and stored (counting my croquet balls before they harden) food for my family. I forage for them. I am a provider. 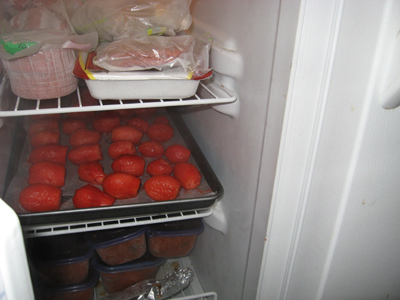 I am a mom that fills the freezer with red round food.